Once making headlines in 2013 for fleet purchases valued at $67 billion, Etihad has seen its strategy of rapidly buying stakes in other airlines to expand its global footprint expose it to major losses. In its last two reported financial years alone, the airline hemorrhaged nearly $3.5 billion in losses. Full-year results for 2018 for the company are expected in the summer. In its statement, Etihad said that it will take delivery of five Airbus A350-1000, 26 Airbus A321neos and six Boeing 777-9 aircraft "over the coming years." The airline said it also will continue to accept its orders for Boeing 787 Dreamliners, without elaborating. It said its remaining orders will be affected by "rescheduling, restructuring or reduction." 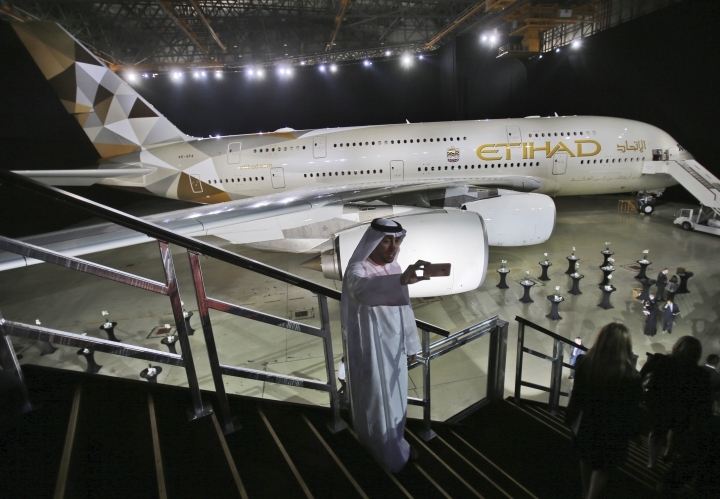 In its 2013 purchase, Etihad made orders for 87 Airbus and 56 Boeing aircraft. Etihad currently has a fleet of 108 aircraft. "This will enable the airline to further progress its transformation and adjust to its new operating model," the airline said. "By restructuring a large portion of its previous orders, Etihad can now concentrate on the phased introduction of new aircraft types, enabling an efficient rationalization of its fleet and building a network that connects Abu Dhabi to the world." Etihad made its announcement amid news from Airbus that the European plane manufacturer would stop producing its iconic double-decker A380 jumbo jet. Emirates, which operates from Dubai International Airport, the world's busiest for international travel that's only 115 kilometers (70 miles) away from Abu Dhabi, meanwhile announced a $21.4 billion-valued deal with Airbus. Abu Dhabi's rulers launched Etihad in 2003. Last year, Etihad began loaning pilots to Emirates under a new program. The two Mideast carriers have seen business hurt by President Donald Trump's travel bans affecting Muslim-majority nations and stricter rules on electronics in cabins. Emirates and Etihad are both government-owned airlines in the United Arab Emirates, a federation of seven sheikhdoms on the Arabian Peninsula. Both compete in the long-haul carrier market, using their nation's location between East and West to their advantage.